Sometimes, during that ever-so-regular search for something rare and interesting in the bargain bins of thrift stores and consignment shops, you run across a record that gives you pause for thought — something so bizarre that you can’t much pass it up. Sometimes, it’s Peter and Wolf with David Bowie doing narration. Other times, it’s a spoken word record with presidential speeches. 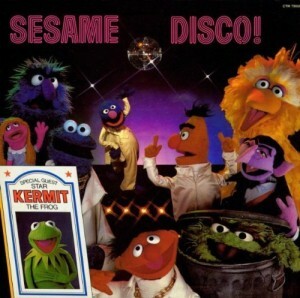 Few can top, though, the strange 1979 recording of Sesame Disco. It’s an album that includes such, uh, hits as “I Lost Me Cookie in the Disco” (“…and me got careless, me don’t know how, and me have something me can’t find now…”) and the inimitable “Bein’ Green” in a strange disco mode. Imagine, if you will, the sounds of singing Muppets, female backups, and that predictably bouncy disco sound. Bizarre, right? It won’t come close to how absolutely weird this is. 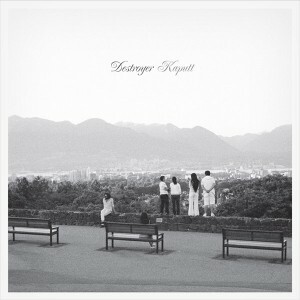 Hell, the album art alone is worth the inevitably low cost of this album. The sight of Grover thrusting forward as he does the hustle, or Ernie with a gold chain around his neck and a white turtleneck, or Cookie Monster with his shirt open wide? Why, that’s all I needed! The addition of Oscar, The Count, Big Bird, Herry Monster, and a young muppet girl with pigtails (Prairie Dawn, is that you?) — why, it’s icing on the cake. Oh, and you mustn’t forget that there’s a sandwich board advertising the special guest star: Kermit the Frog! The gatefold also shows some of the Muppets with children. That’s sort of weird. And if you couldn’t get enough of the front, why, it’s repeated on the back, only, you know, smaller. It’s a weird one. Sure, this was a novelty record for kids, but there’s plenty here to enjoy. If you’re looking for something strange and exciting to listen to repeatedly, though? Well, don’t look here. Those backing female vocalists just keep going and going and going: It’s enough to drive anyone crazy. 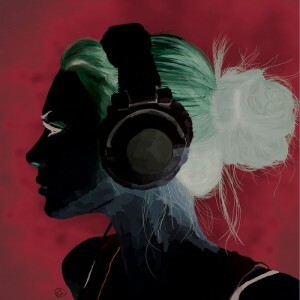 And those bouncy beats? If you’re feeling particularly down, listen to this. If it doesn’t help immediately, turn it off. This is somehow lots of fun, but it’s also enough to drive one to madness. “Disco Frog” is particularly egregious. It included a moment where I thought the record was skipping — I found out after 10 or 15 seconds that the repeated bass line and the “ribbit ribbit” was quite intentional. Oh, boy. I will say this much: The disco rendition of “Bein’ Green” is actually kind of interesting. Who’da thought? Is it fair to criticize a kid’s album from 1979? Well, probably not. But this is Sesame Disco! — it’s in a world all its own. If there’s one thing we can certainly agree on, it’s that this is definitely one strange find. 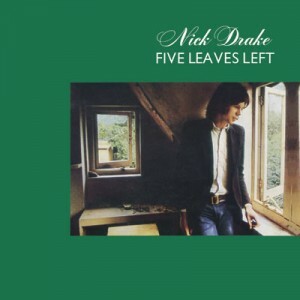 The front cover of Nick Drake's Five Leaves Left. Photography by Keith Morris. The inimitable Nick Drake, recognized after his death as a brilliant songwriter but rarely before, is still the master of that brand of moody, emotive finger-picked acoustic guitar. The haunting melodies, the unshakable vocals, the ability to move through song: Nick Drake, an English songwriter but a speaker for deep veins of sadness and despair running through all culture, is still untouchable as a musician. His first album, Five Leaves Left, was produced between 1968 and 1969, when Nick was 20 and 21. Keith Morris was asked to photograph Nick for the album cover by the album’s producer. Incidentally, this was the first album cover Keith would work on, and it’s one that defines him still today. The moment for both young artists, both near the start of their careers, was the first in an unfortunately cut short collaboration between the two, in which Keith photographed Nick in conjunction with each of the three legendary Nick Drake albums: Five Leaves Left, Bryter Later, and Pink Moon. 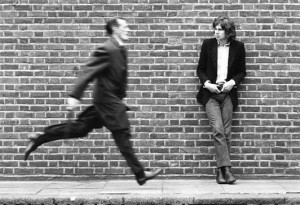 • Visit the Keith Morris Gallery online for more of the iconic photographs of Nick Drake. Keith, still, had little chance to engage the elusive Nick Drake; despite being the only professional photographer to work with Nick, he hadn’t worked with him aside from the work the three albums — and then, on but a single day for each. The artwork taken for Five Leaves Left, the first of those opportunities, captures the young Nick Drake looking perhaps as contemplative as his early music. 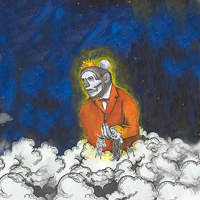 The photograph used for the front of the album depicts Nick gazing out a window, and presumably, the only light in the room being the natural light coming from the two windows seen in the photograph. The strong shadows cast by only in the corners of Nick’s Hampstead flat set the mood for the music: The whole thing is not cast in shadow, though certainly parts of it are. The play between the light and the dark serves as a visual metaphor for the bleakness and the exuberance heard contrasting in Nick Drake’s guitar work and vocals. The photograph from the reverse side of Five Leaves Left. © Keith Morris. Image used under Fair Use rationale. The photograph on the reverse side is as much revealing, but it exists more as a metaphor of Nick Drake’s musical attitude than of the musical performance. 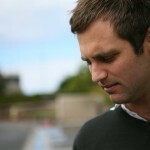 Nick, against a brick wall, is still, and again, he is gazing into the distance. It’s not the gaze of a combat-hardened soldier, that thousand-yard wear gaze. 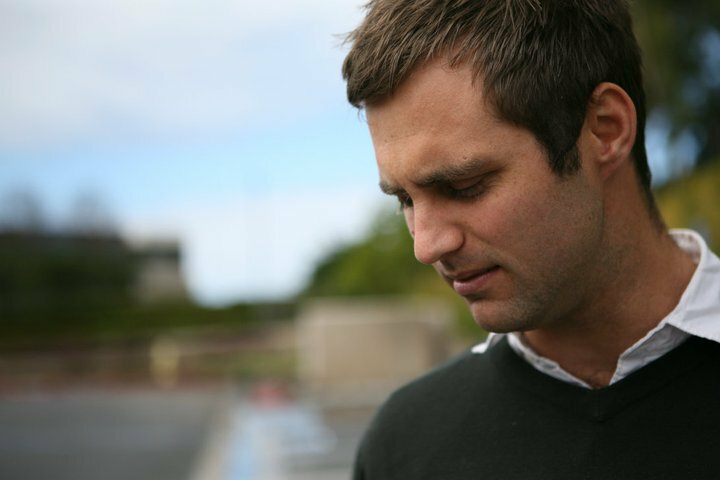 Nick is instead looking almost wistfully into the distance, unaware that, ahead of him, people are running by, carrying about with their busy lives. The specific photograph in the series depicts a man, perhaps a businessman, running into the frame in some sort of rush. Through the visual metaphor of Morris’s photographs, the album gains additional valuable meaning that could not be achieved without a visual narrative, as non-literal as it may be. There is a specific art in capturing the combination of weariness and optimism that is packaged gracefully in Five Leaves Left: Keith Morris, for his part, tells the story of Nick Drake, the musician, through these two beautiful photographs, and through the others he took throughout the musician’s tragically short career. Disclaimer: Folks, if you don’t know by now, your further searches into this project will show that, yes, this is my project. And I am basically using my own pull to advertise my own work. I am the editor and coordinator of this project, came up with the idea and what not. I feel as though I can rationalize doing this since we have so many other great folks involved with this project that deserve all the recognition they can get. And we are doing it all to find a cure for cystic fibrosis. So leave judgements at the door, and you will find something awesome below! With the holiday season upon us, an almost nearing completion, it might be a good time to start thinking about one of the finer, and probably more noble, sides of the season – The Giving. But, as most of us know, but may not want to admit, sometimes the benefit of giving is actually the getting. So how we solve the dilemma of trying to give back, and at the same time receiving something awesome in return? I’d like to say, “there’s an app for that”. And there may very well be. But, there is also a nice charity project in development that could very well offer just what we need.